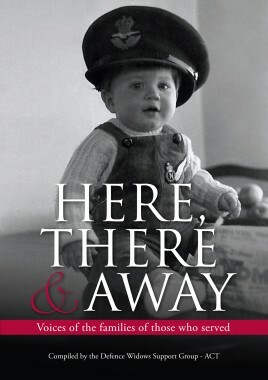 Here, There & Away is a unique collection of entertaining stories from the families who support our service men and women. Spanning the three branches of the Australian Defence Force this is a literary first. The stories cover the period from World War I to more recent times, and celebrate the love, care and support given by and to members of the wider defense family as well as the resilience required in diverse locations and situations. Some stories will tug at the heart strings while others are funny in the extreme. Many touch on significant historical events. There are a number of stories that will surprise and enlighten - all within a gentler context than the normal genre of military history. The reader will be left pondering and maybe even enticed to further explore some aspects of Australian military history. The stories in Here, There & Away poignantly depict the ups and downs of everyday life for military families in times of war and peace, but they also reflect many aspects of life experienced by the wider community. This collection is an important contribution to Australian social and military history, and an entertaining and uplifting book for readers of all ages.